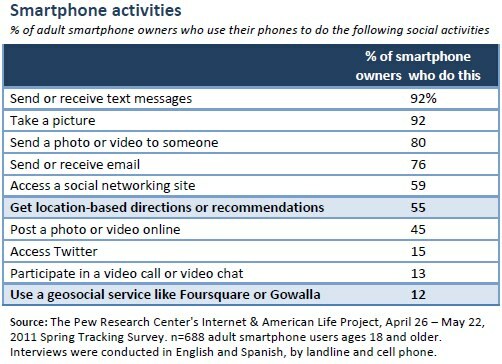 Smartphone owners – One in ten smartphone owners (12%) have used a geosocial (“check in”) service such as Foursquare or Gowalla, and 55% of smartphone owners have used a location-based information service. Almost six in ten smartphone owners (58%) use at least one of these services. These are all well above the average for cell owners as a whole. 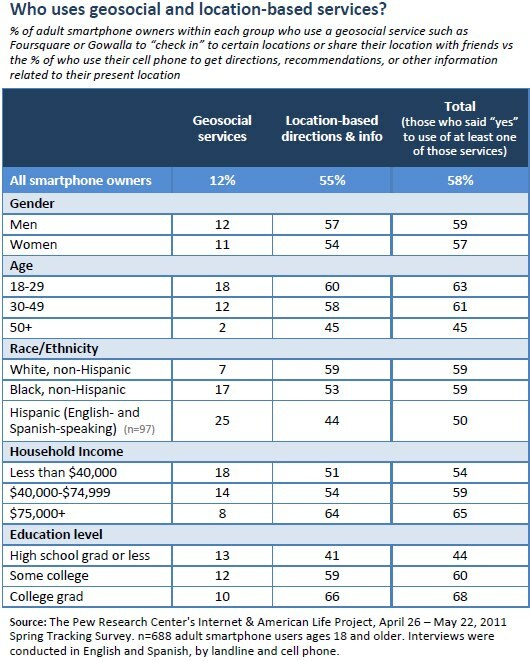 Non-whites – Geosocial services and automatic location-tagging are most popular with minorities, continuing a trend of mobile connectivity that has been seen in other Pew Internet surveys.8 Hispanics are the most active in these two activities, with a quarter (25%) of Latino smartphone owners using geosocial services and almost a third (31%) of Latino social media users enabling automatic location-tagging. However, though only 7% of white smartphone owners use geosocial services, 59% get location-based information on their phones, compared with 53% of blacks and only 44% of Hispanics. The results reported here are based on a national telephone survey of 2,277 adults conducted April 26-May 22, 2011. 1,522 interviews were conducted by landline phone, and 755 interviews were conducted by cell phone. Interviews were conducted in both English and Spanish. For results based on all adults, the margin of error is +/-2 percentage points. For results based on smartphone owners, the margin of error is +/-4.5 percentage points (n=688). 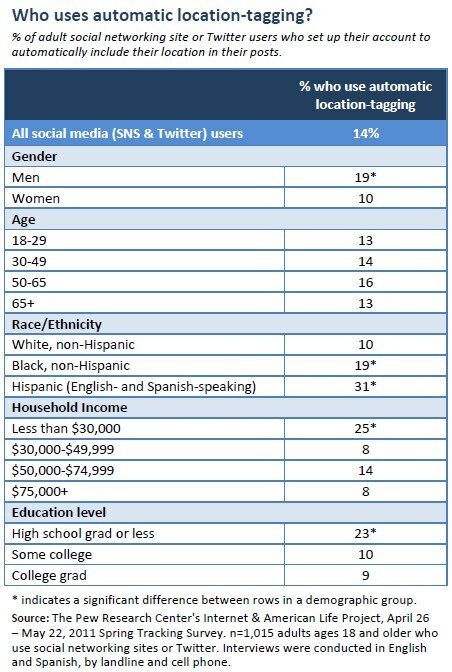 For results based on social networking and Twitter users (“social media users”), the margin of error is +/-3.5 percentage points (n=975). Fully 83% of all American adults ages 18 and older own a cell phone, a number that has remained relatively steady since mid-2008. 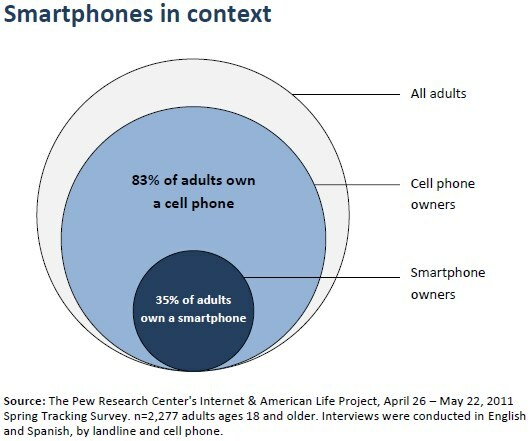 Of these cell phone owners, 42% own a smartphone, which translates to 35% of all adults.9 Almost six in ten (58%) of these smartphone owners use a geosocial or a location-based information service of some kind. 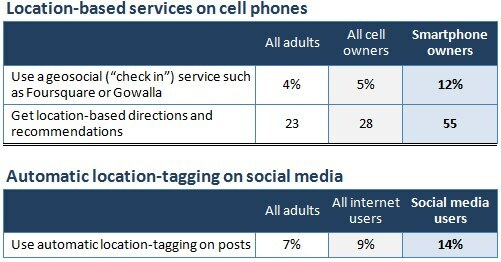 Among smartphone owners, geosocial “check in” services service such as Foursquare or Gowalla are most popular with younger adults (under age 50) and minorities. Geosocial services are also less popular among smartphone users in households making at least $75,000 per year than among those in lower income brackets. There are no significant differences by gender or education level. In looking at broader uses of location-based services, we found that 55% of smartphone owners use their phone to get directions, recommendations, or other information related to their present location. This was the first time the Pew Internet Project has asked about general location-based services, which can range from GPS-enabled map services to reviews of nearby attractions using an app or a browser. Younger adults are more likely to use these services, as are those in households making at least $75,000 per year. Smartphone owners with more education are also more likely to use these services, with 66% of college graduates using them, compared with 41% of those who have not gone to college. In contrast to geosocial services, Hispanics and those making less than $75,000 per year are actually less likely to use location-based information services. There are no significant differences by gender. Many social media sites, including social networking sites such as Facebook and the status-updating service Twitter, enable users to set up the service to automatically post information about their current location along with their updates on the site. Our survey found that 14% of social media users take advantage of these services, and have set up their account to automatically include their location in their posts. Men, minorities, those making less than $30,000 per year, and those who have not gone to college are significantly more likely than other social media users to use automatic location-tagging. There are no significant differences between social media users of different age groups.